« Have we become Big Brother? On March 23rd, 2015 the Supreme Court heard arguments in the case Walker vs. Sons of Confederate Veterans. The question before the court in this case is whether the state of Texas can deny motorists a special state license plate. The group Texas Sons of Confederate Veterans wants the state to grant their request to create a new Specialty License Plate for their group. In Texas there are already numerous organizations that have such plates including animal rescue groups, various universities, and even the Dallas Cowboys. The problem is that this group would like to include the Confederate Battle Flag on their new plate. The controversy and debate surrounding this case brought to mind a recent exchange I had with the administration of a local middle school here in Houston. While accompanying my stepdaughter to a middle school swim meet back in December, I noticed something disturbing, a Confederate Flag hanging in one of the upstairs classroom windows. It was large and visible from the outside walkway as we entered. While it may be a matter of free speech for a teacher to own and display this symbol on their private property, it should not be part of their classroom decorations. For many people, particularly African-American students, this is a symbol of white supremacy, hate, and oppression that they should not be forced to observe on a daily basis in their public school classroom. I requested that the flag be removed and the teacher asked to explain why it had been displayed in the first place. Dr. Benjamins – Many thanks for reaching out. The flag on display is one of six in our 7th grade Texas History teacher’s classroom… Each flag represents a sovereign nation that controlled Texas. As you are aware, the Confederate States of America had sovereignty from 1861-1865, in between stints with the United States of America (1845-1861; 1865-present). To be honest, I wasn’t surprised that both the principal and the teacher (who is teaching history in a Texas public school) both had their history so wrong. So much of what has previously been taught and continues to be taught about the Civil War throughout the United States is not based on current historical scholarship, but on the myth of the Old South created after the fact. I took this as an opportunity to educate the principal and teacher with the hope that they might not only remove the flag, but also that they might teach future students an accurate historical narrative about Texas and the Civil War. Clearly, it can be a little confusing because in the short history of the CSA it did have three national flags. However, there are two points that you bring up that go to the heart of the problem. First, it is true that Texas participated in an effort to secede from the United States and join the Confederate State of America. And those states claimed that they were a sovereign nation. However, in no way were they ever sovereign. Not legally, militarily, nor most importantly diplomatically. No other nation recognized their independence and based on the basic definition of a sovereign nation they met none of the criteria. Second, yes it is important for students to understand the role that Texas played in the unrecognized state that was the Confederate States of America, but only a flag that actually represented the CSA can enhance that understanding. 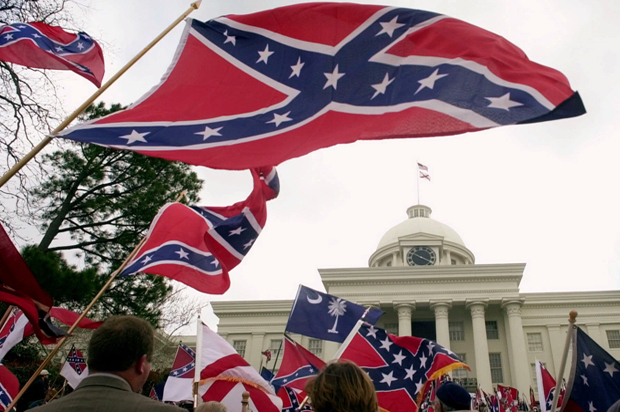 The one on display … was never an official flag of the CSA and never flew over Texas. The flag on display is a 20th century combination of the CSA Battle Flag’s colors with the CSA Second Navy Jack’s design. The historical reality is that states like Texas returned to flying their state flag or possibly one of the three CSA national flags, but the flag on display in the classroom never flew over Texas in any way. While the flag on display is known as The Confederate Flag, the fact that it wasn’t used until the 20th century is problematic… because it was used for the most part as the symbol of white supremacy, the Jim Crow South, and by members of the KKK…. Dr. Benjamins – Thanks for the edification and links. You are very correct; we have removed the flag and ordered the appropriate one for that period…. While this was clearly a victory (at least a small one), the fact that it happened at all shows that we, as historians and educators, still have much work to do. Yet, the problem can’t be left only to the professionals. A cultural paradigm shift will require all those who know the Confederacy committed treason in defense of slavery to stand up to those who promote misinformation and hatred. Some media reports suggest that the Supreme Court will likely rule in favor of banning the Confederate flag on the Texas license plate, while some suggest that as despicable as the flag is the ban infringes on free speech. If Texas is allowed to ban the specialty plate more legal cases are sure to follow. Numerous southern states, including Alabama, Georgia, Louisiana, Maryland, Mississippi, North Carolina, South Carolina, Tennessee, Virginia, and West Virginia all allow vehicle owners to request a state-issued license plate featuring the Sons of Confederate Veterans logo. I would suggest that the problem is really not the fact that some Americans would choose to display the Confederate flag on a license plate or elsewhere. The problem is that so many Americans believe that the Confederacy is something to celebrate at all. Even those like my middle school principal and teacher who want to do the right thing just don’t know their history. It will take time, possibly decades, to re-educate the American public, particularly the South, about the historical realities surrounding the Civil War. While this is a campaign of monumental proportions, I relish the challenge and look forward to continuing the struggle. This entry was posted on March 27, 2015, 12:27 pm and is filed under Civil War, education, free speech, history, racism, slavery, social commentary, Supreme Court. You can follow any responses to this entry through RSS 2.0. Responses are currently closed, but you can trackback from your own site.